Until Chris Gayle arrives in early December after recovering from injury, the Barisal Bulls have to make sure they get the best out of the rest of their squad. The likes of Brendan Taylor, Sabbir Rahman, Mahmudullah and Al-Amin Hossain will have to carry the team forward. Their local players are largely a proven lot, especially Rony Talukdar and Mehedi Maruf who have batted well together as openers in domestic cricket. Nadif Chowdhury and Sharifullah are useful allrounders while Taijul Islam is the team’s lead spinner. 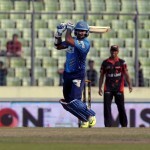 The franchise has also built loyalty by picking Barisal stalwarts in Sohag Gazi and Shahriar Nafees. Graham Ford, who is the head coach of Barisal Burners, will look to guide the team to a better finish this season. Bulls have six matches from December 1, which means that Chris Gayle could still create a big impact for the franchise. He has struck 402 runs, including three centuries, in six BPL matches at an average of 100.50. Mehedi Maruf played only one BPL match in 2013 but he has since grown into a dependable opening batsman in domestic first-class and one-day competitions. He goes after the bowling, and is particularly strong against pacers, besides having the ability to clear the infield regularly. The Chittagong Vikings have a good mix of local and foreign players, and look quite strong on paper. Tamim Iqbal, Tillakaratne Dilshan, the Akmal brothers, and Elton Chigumbura form an impressive top order while the likes of Chamara Kapugedara, Jeevan Mendis, and Robin Peterson provide muscle with the bat down the order. On the bowling front, much will depend on Mohammad Amir. Saaed Ajmal, Enamul Haque jnr and Elias Sunny offer spin options though all three are quite unlikely to feature together. Taskin Ahmed’s fitness continues to be a cause for concern, which means there will be more opportunities for Shafiul Islam and Robiul Islam. This could be the time for Tamim Iqbal to finally crack the T20 code, after having two modest BPL seasons. He will once again turn out for his home division, along with his elder brother Nafees, and seeing them open together could be a reality this time. Mohammad Amir may not be on Pakistan’s radar but the BPL gives him a platform to fire and prove his prowess again, after the lifting of his five-year ban. Also, expect a lot of media attention on the left-arm fast bowler. The likes of Nasir Jamshed, Ryan ten Doeschate, Kumar Sangakkara, Nasir Hossain, and Mustafizur Rahman give Dhaka Dynamites a dangerous look. Yasir Shah is another aggressive pick while Mosharraf Hossain was a strong performer in the previous BPL for the Dhaka Gladiators. The local back-up options could spring a surprise or two as Mosaddek Hossain Saikat, Abul Hasan and Shamsur Rahman had produced good performances in this season’s domestic competitions. Mickey Arthur is the most high-profile coach in the tournament, and much will be expected from this team this season. Mustafizur Rahman is the most talked about cricketer in Bangladesh at the moment, and will remain in the limelight despite the presence of bigger stars in the BPL. His variations will be the key, with the T20 format presenting a new challenge. He would also need a bit of preservation given his heavy workload since early 2014. This article was originally published in www.espncricinfo.com. Here is the link to the article.